I'm gone for a week to see family and stuff... don't have any ways to upload music at all so I'll just link something if I need to. I was browsing the hype machine trying to find new stuff to listen at when I'll be back home and I found a link to a Super Mash Bros album (that was given out if I understood well, if not, I'll remove the link). So what are Super Mash Bros? No I didn't forget the S in front of Mash. They actually do some random mashups with known songs. I found out after listening to their songs that they usually (USUALLY) just take a rock song and put rap lyrics instead of the real ones. Although, some songs are pretty freaking groovy and fun to listen at. Nothing big really, but fun. I would suggest you find "Kisses and Thugs" from them also, it's pretty fawking good. 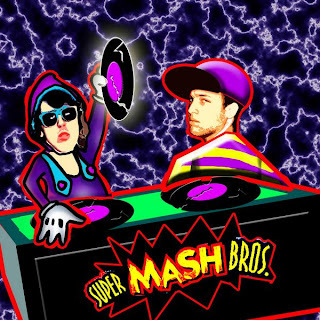 To be more precise about Super Mash Bros, their songs are just like a live set, but split into "songs". You'll understand after you listen to it. I don't feel like getting mad anymore so I will stop my post here. Sorry but this keyboard makes me want to cut my wrists and suicide. It's like a laptop keyboard but even worst: the keys are small and stick to my fingers and ... and ... whatever. When I'll be back I'll do some monster post or just a normal post, but with good music to listen at. PS: I'll try uploading Kisses and Thugs when I get back home and giving a good link to it if anyone still wants it. This entry was posted on Saturday, July 4, 2009 and is filed under Super Mash Bros. You can follow any responses to this entry through the RSS 2.0. You can leave a response.